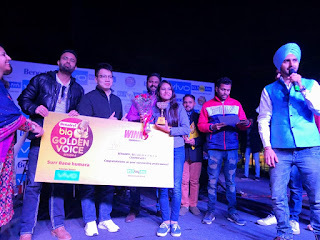 Chandigarh 29th December:- Encouraged by the roaring success of the 5 seasons of the mega singing talent hunt on radio, India's leading FM Network , Reliance Broadcasting, recently announced the 6th season– 'Benadryl Big Golden Voice' , getting the most lovable voice of the country Sonu Nigam as the main judge . With the promise of showcasing a bigger and better-than-ever season, the show is being conducted across 59 stations of 92.7 BIG FM. With audiences voting for their favorite regional singers and then national, the talent hunt is supposed to culminate into a Grand Finale thus identifying the 'Benadryl Big Golden Voice' that gets a direct entry into Bollywood! The City beautiful Chandigarh's regional finals for the radio's biggest singing talent hunt show were held at Sector 17 Chandigarh. Renowned Punjabi singer Gagan Kokri known for his melodious romantic songs in Punjabi music industry 'Blessings of Bebe', 'Laavan Tere Naal', 'License', 'Shatranj', today judged the 5 selected contestants, which had 3 different rounds for the contestants to prove their metal. Highlighting the response Big FM got from the Tricity, Regional Programming Head Big Fm Sulakshna Bramta said that, 'we received nearly thousand talented voices and out of them top 15 were selected, and further reduced to super talented Top 5 namely Nitesh Shukla, Gurvinder Guri, Preeti Tiwari, Atul Dubey and Vinay Yuvraj. Tricity voted for them on digital platforms and today they competed for becoming the voice of the Tricity and ultimately getting trained and judged by none other than Sonu Nigam. The top winner was taken out basis percentage of votes and live performance in Sector 17 in front of live audiences. The selected top finalist of Chandigarh now gains entry into the national level competition & 12 shortlisted voices will then go on to represent talent from their regions on a national platform. During the course of their practice, 92.7 BIG FM will take them to Mumbai and allot each contestant a guru. With a 2-day workshop on Sur Saaz and Awaaz with their gurus, these 12 finalists will then compete to take home the coveted title of the next BIG Golden Voice and a prestigious opportunity to kickstart a career in playback singing in Bollywood. Chandigarh 29th December:- Desh Bhagat United, a brand name in the Industry is once again all set to add another feather in its cap with the grand opening of "D Buzz & Veggie Green". New restaurant with vegan options is making its debut this weekend. The restaurant is located in Sector 8, Chandigarh. This eatery has been inaugurated by Amit Talwar, (IAS). He wished all the best to the entire team of D Buzz & Veggie Green and hoped it will become the first choice of Veggie food lovers in a very short time. Equity Score's Professor Paul Douglas Katchings informed that the mission of Veggie Green Express is to create more value for people through easier access to healthy vegetarian food and to keep our natural environment 'green'. A chain of 14,000 vegetarian restaurants will soon to be setup in India and Ghana. The Venture is ready to give a mid-Winter bonanza to the food connoisseurs of the tri-city by opening a new D Buzz Restaurant. D Buzz & Veggie Green is committed to providing guests with an exceptionally delicious range of food and beverages. The menu includes an extensive range of food, Original Blend drip coffee; espresso based coffee beverages, as well as a delectable range of sandwiches made out of artisan breads such as focaccia, croissants, ciabatta and bagels. The beverages menu has also been expanded with fruit milkshakes, smoothies and tea. 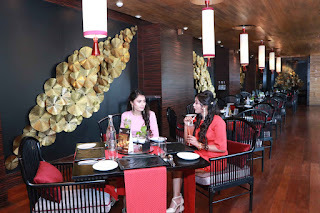 The vegetarian restaurant has a sumptuous cuisine comprising of frontier, Indian food with Chinese, gelling well with the Chandigarhians' palate is so enchanting which would create an indelible impression in the minds of esteemed clientele for years to come. The Restaurant offers a wide variety of snacks and starters. The production has worked day and night to come up with a special Menu which has been introduced for the first time in the tri city. 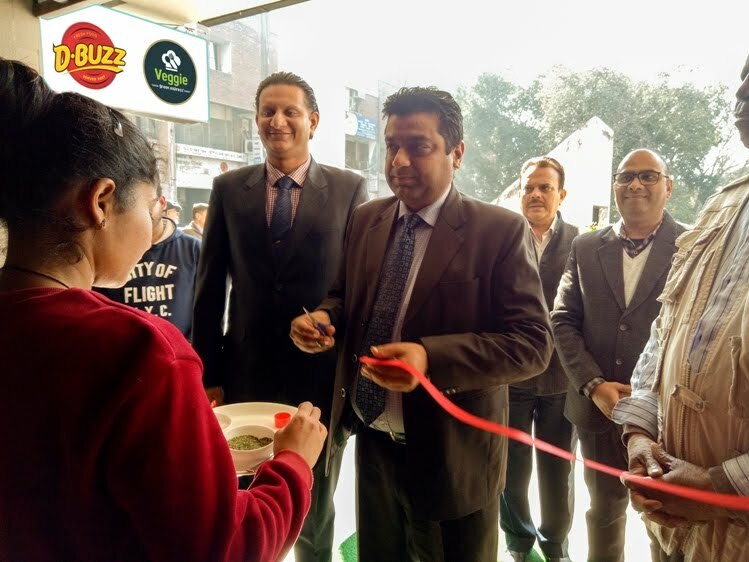 Sharing his views on the event, Desh Bhagat United Chairman Dr. Zora Singh, said that D Buzz & Veggie Green's believes in giving back to the community in which it operates and Chandigarh is a very important market for us. It brings us joy and satisfaction in being able to spread healthy food and healthy life. Speaking on the launch of "D Buzz & Veggie Green", Vice President Desh Bhagat United Er. Sandeep Singh, said that Chandigarh is an extremely exciting destination for our brand. We find customers here are not just appreciative of food but also in tune with the latest international trends. We bring an exciting new all day part menu served in a fast, friendly and modern environment. Chandigarh 29th December:- C.L. Aggarwal D.A.V. Model school sector 7-B Chandigarh, celebrated the most cherished Annual Day '' Dharohar "at Tagore Theatre Chandigarh. S. Paul Chairman and Managing Director of Paul merchants Ltd. was the Chief guest and Subash Goyal MD Vardhan Auyerveda Ltd. And Ravinder Talwar Secretary DAVCMC graced the occasion . The cultural fiesta started with the Mantra Ujaran and Welcome Dance. All present took the blessing of lord Saraswati. The function witnessed a fabulous array of dance and musical acts. Kindergarten students dressed in colourful attires, and presented group dance surprised the audience with their rejuvenated energy. The mesmerizing culture show with the maximum participation of the students grabbed the attention of all parents. A colorful dance bonanza was staged by the students as they started with Gyatri mantra spreading the happiness in the surroundings followed by the Religious performance. Jazz Ballad on save water and pollution brought a thunderous applause from the audience. Students represent the theme Dharohar by dance performance showcase the dance from different states. Principal Sunita Ranyal read the Annual school report which was aimed at giving glimpse of the school performance and achievements in the various curricular as well as Co-Curricular activities held during the session. She also thanked the parents for being so supportive at each step. The chief guest appreciated the efforts of the students and the parents. He also applauded the efforts of the team of teachers of the school for putting wonderful and successful show. The culmination was marked by the vote of thank and the National Anthem. Chandigarh 28th December:- Having many success stories to its credit since 1999, the country's reputed public relations company PR 24x7, has completed its 19-years significant journey in the world of Public Relations. With the aim of making this spectacular journey special to everyone, the company has decided to give free branding advice to many big and small startups across the country. Along with, the company is also going to provide free advice to the various politicians of the country for their image building. This initiative of PR 24×7 will prove to be very useful in promoting fast emerging startup culture in the country and improving their portfolio. This initiative will enable politicians to find a great opportunity to be in touch with the masses before the general elections to be held in 2019. The company will make this service available for the next three months from the beginning of the New Year. Commenting on the company's initiative and the role of PR, Atul Malikram, Founder, PR 24×7 said that even today, most of the people in the country believe that public relations i.e. PR for a product or company is an expensive deal. But, in fact, if your PR is strong, then the prospects of getting more opportunities on the professional front are increased. The precise way of public dealing is to have a better image of you and of course, we have expertise in this craft. PR 24×7, from the beginning of the New Year to March 31, 2019, will be going to provide free advice for branding and image building to all startups and politicians of the country. This, may be the first time in India, is a endeavor where a public relations company has announced to provide free advice for branding. Atul further said that it is extremely important for any new startup to have its brand information spread in the market and among customers so that people could know about their products and services. It is important to understand that PR is a key role in reaching the market and attracting customers towards the brand. Similarly, it also works for the political parties and politicians. Any political campaign drives onward only with the advice of a PR Professional. The one-way victory of the Modi government in 2014 can be seen as the best example of a great PR. The success of the campaigns like the Clean India or the Beti Bachao-Beti Padhao is also based on the PR principles. We make our best efforts to track each and every information related to our clients through the print and digital PR. Besides, we also keep an eye on every movement of their market competitors. Converting its 19 years of struggle into a great success, the Company has positioned itself among selected top PR companies in the country. Started with a room and two persons in 1999, the PR 24×7 journey has reached today many major cities across the country. The company is providing its services in 81 cities like Mumbai, Bangalore, Chennai, Lucknow, Guwahati and Srinagar etc. Moreover, having a direct grip on every news and views, from more than 1700 newspapers, the institution helps its clients to connect with their market segment and spread their messages in the public. The organization has a team of over 100 professionals to achieve its goals, which includes Strategy Planners, Media Managers, Copy Writers, Researchers and PR and Marketing Experts. Chandigarh 28th December:- Kia Motors, world's 8th largest automaker, today during a facility tour showcased that the enormous 536-acre plant at Anantapur that is on the verge of completion and the company is expected to roll out its first product, the SP2i in India around September 2019.The upcoming car is being manufactured in the company's Anantapur plant and will be equipped with world-class quality, finest design and state-of-art technology. The company aims to be amongst the top 5 automakers in India within three years. Kia Motors made its debut in India at the Auto Expo 2018 and showcased its 16 top global line-up along with SP2i, the most liked car at the Auto expo. Drawing inspiration from India and the 'powerful' face of India's very own 'Royal Bengal Tiger', the car carries Kia's famous and the most distinctive feature- 'Tiger Nose Grille', designed by Chief Design Officer, Mr. Peter Schreyer. The car truly fits into the 'Make in India' segment and combines everything Indian customers desire in a car promising state-of-the-art technology with a sporty, stylish design. Kia started its India operations nearly a year ago with the inauguration of its plant at Anantapur, Andhra Pradesh where the work is in full swing. With the plant being nearly ready, it will be operational by second half of 2019. The plant has an annual installed capacity of producing over 300,000 vehicles and expects to create over 3,000 direct and 7,000 indirect jobs in the region. Kia has invested around 1.1 billion dollars in the plant to ensure the availability of best of local manufacturing, while offering technology as per global standards.The plant is also capableof producing hybrid and electric vehicles. Kia takes immense pride in the fact that the plant has the most advanced global technology such as Robotics & Artificial Intelligence and is remarkably environment friendly with capabilities like 100% water recycling within the plant. In addition to this, the company also introduced a Basic Technical Course (BTC) in automobiles for skill development to provide all the skills necessary for an entry-level job on the factory floor, in the plant.The entry in Indian market will play a crucial role complementing company's other plants in Korea, Slovakia, China, USA and Mexico. Entering the Indian market, Kia plans to expand its portfolio by launching cars in every six to nine months, lining at least 5 vehicles by 2021. The brand is deeply focusing on future mobility, design, product and capacity along with world-class vehicle maintenance and repair services facilities to create strong foundations in the country by providing the best car ownership experience to Indian customers. Kia Motors Corporation has more than doubled its global sales since 2008, reporting sale of 2.8 million cars last year Aligning with the global vision of Kia Motors Corporation to launch 16 electric vehicles by 2025 and make the planet greener and cleaner for the generations to come, Kia Motors India is committed and confident of producing hybrid and electric vehicles at Anantapur plant. Recently the company signed a Memorandum of Understanding (MoU) with the state of Andhra Pradesh to collaborate on the 'Partnership for Future Eco Mobility' by giving Niro model–Hybrid, Plug-in Hybrid and EV–to Andhra Pradesh government. Kia vehicles are the highest quality products in the world today. Kia has surpassed all other global automobile brands sold in the USA to achieve the top ranking for four consecutive years in JD Power's Initial Quality Study. To maintain this quality, the company is focusing on training & upskill indigenous talent in India to create highest level of localization in the products without compromising on global quality. Kia has been a global custodian of sports partnering various global sporting events such as FIFA World Cup and Australian Open. The company is bringing this legacy to India by encouraging millions of sports enthusiasts in the country. Through the Kia Official Match Ball Carriers program, Sunil Chettri, Captain of the Indian National Football team selected two kids to represent India along with 62 others from around the world during the World cup. Last month, Kia Motors India partnered with Bengaluru Football Club as a principal sponsor for the ongoing season of the Indian Super League 2019 through to end of the 2021/22 season. Recently, the brand selected top 10 tennis enthusiasts who will represent India as the official ballkids at the Australian Open in January. The kids were mentored by ace tennis player, Mahesh Bhupathi and will be sent on a fully sponsored trip for three weeks to Melbourne. Chandigarh 27th December:- New Zealand's prominent chef and restaurateur, Sid Sahrawat along with his wife Chand Sahrawat are in Chandigarh to share their New Zealand journey with the media today and to provide their children a glimpse of their cherished Indian culture. Today, they are building a legacy in New Zealand which comprises three award winning restaurants – Sidart, Cassia and Sid at The French Café. Hailing from a small town in Mohali, Sid went to Yadavindra Public School. Returning to the city of Chandigarh, he says, brings back a lot of fond memories of friends, cricket and growing up. Talking about his Indian roots, Sid Sahrawat said that his fondest memories are of his grandmother making parathas for breakfast and his grandfather teaching him maths. His father was in the Indian Army, so he have learnt a lot of discipline that he need to run three kitchens from his time with him. His love for Indian food comes from growing up in India and travelling to different places with his dad through his postings. Sid has spent almost nine years making his indelible mark in Auckland with acclaimed restaurants Sidart and Cassia. He is known to reflect seasonality in his dishes and use the freshest of ingredients. He infuses his creative culinary skills with the traditional dishes he has grown up with in India–classic spice and flavour combinations reworked with contemporary and local New Zealand ingredients. Sid Sahrawat won best chef and he along with his wife Chand won best restaurateurs at Metro Peugot Restaurant Of The Year 2018 Awards. Also, Sidart and Cassia won the first and the second spot for the restaurant of the year at the awards. Sidart was awarded 2 Hats this year with Cassia winning the Best Metropolitan Restaurant at Cuisine Good food awards 2018. Additionally, Sid at the French Café and Sidart are the highest rated restaurants in New Zealand to feature in LA LISTE world's best restaurants, among top 500 in the world. At a media event in Chandigarh today, Sid served one of his signature dishes-traditional Indian tandoori chicken in slider buns. These mini burgers serve as an excellent snack and are a great choice for parties and are his daughter Zoya's favourite. Speaking at the event, Sid said that the only hurdle he faced in New Zealand, was changing people's perception about Indian food. Most Kiwis relate to Indian cuisine as butter chicken which is quite sweet and creamy. But today, with two successful Indian restaurants, Cassia the modern Indian and Sidart progressive Indian, a lot of kiwis have moved away from that notion and experiment more with Indian cuisine. Both restaurants showcase the best of New Zealand's produce in a contemporary Indian format that is more formal and precise execution of the cuisine. The evolution of his restaurants reflects his identity as a chef. He beautifully ties his Indian roots to the progessive taste of New Zealand's appetizing flavors. Though work takes over most of Sid and Chand's time, they do make time for holidays, he love to take friends and family to Waiheke Island, a short ferry ride from Auckland, to explore the beaches and vineyards. Paihia in the Bay of Islands holds a special place in his heart as he worked there for a few months as a young chef: the beauty of Northland is unique and unparalleled. Rotorua is a great stop to explore not just the thermal pools but to partake in a traditional hangi in a Maori village and Queenstown as we all know is breath-taking for its views of the mountains and lakes. Sid said that through the ups and downs ofhis journey, his main pillar of strength has been his wife, Chand Sahrawat as she shares his passion for food and has adapted to the industry very well. Her family background in business helps them make key decisions together. Sid's restaurants are at the peak of success and a testament to a combination of passion, talent and hard work. Chandigarh 27th December:- Petroleum and Natural Gas Regulatory Board (PNGRB) organized a roadshow for promoting 10th City Gas Distribution (CGD) bidding round here today. Petroleum and Natural Gas Regulatory Board (PNGRB) is the nodal agency for facilitating economic activities in natural gas distribution with the objective to promote competitive markets, create infrastructure and increase share of natural gas in country's energy mix. PNGRB has so far successfully concluded 9 CGD Bidding Rounds for selection of authorised entities for development of City Gas Distribution (CGD) networks in their Geographical Areas (GAs). The recently concluded 9th bidding round for 86 GAs covering 174 districts in 21 states/ UTs was a huge success attracting interest from investors in all offered GAs. The 10th CGD Bidding Round offering 50 GAs was launched by Hon'ble Prime Minister, Shri Narendra Modi on 22nd November, 2018 at Vigyan Bhawan, New Delhi. This roadshow is the 1st in a series of roadshows being planned across India by PNGRB over next 3 weeks and witnessed participation from the senior Government officials, oil and gas companies, industry and academia. Depinder Singh Dhesi, Chief Secretary, Govt. of Haryana was the Chief Guest. At present, CGD authorization has been given by PNGRB in 10 GAs in state of Punjab covering 13 districts namely SAS Nagar, Patiala, Sangrur, Ludhiana, Barnala, Moga, Jalandhar, Kapurthala, SBS Nagar, Amritsar, Bhatinda, Rupnagar, and Fatehgarh Sahib. In the 10th CGD bidding round, 3 GAs covering 6 districts- Mansa, Ferozepur, Hoshiarpur ,Faridkot, Sri Muktsar Sahib and Gurdaspur are being offered. CGD authorization has been given by PNGRB in 13 GAs in state of Haryana covering 16 districts namely Sonipat , Panipat, Yamunanagar, Rewari, Rohtak, Karnal, Ambala, Kurukshetra, Panchkula, Bhiwani, Charkhi Dadri, Mahendragarh, Hisar, Jind, Nuh and Palwal. In the 10th CGD bidding round, 2 GAs covering 3 districts of Sirsa , Fatehabad and Kaithal are being offered. It may be noted that a total of 4 GAs are on offer for both the state combined with Sirsa, Fatehabad (Haryana) and Mansa (Punjab) Districts grouped in 1 GA.
After the 10th round, States of Punjab and Haryana and UT of Chandigarh would be fully authorized for development of CGD Networks. This is a big initiative towards providing clean energy to the users in Haryana, Punjab and UT of Chandigarh. In the presentation on the 10th CGD bidding round, PNGRB highlighted the opportunities in the oil and gas sector in India and in the CGD business in particular. India's story in the natural gas sector, increasing domestic production and LNG imports to meet gas demand ; along with the country's commitments at COP21, has pushed the Indian government to bring in sweeping policy changes that are giving a boost to the domestic gas market. The roadshow was marked by the presence of Depinder Singh Dhesi, Chief Secretary, Govt. of Haryana. Depinder Singh Dhesi mentioned that similar to transition from GSM to 4G, the Energy Sector is also in transition Phase from Petrol, Diesel to PNG. He added furthr that under the aspirational district program of Niti Ayog, Palwal and Nuh have been taken up as backward districts for focused intervention by various departments and he make a special request that roll out of scheme in district Nuh be taken up on priority. Depinder Singh Dhesi said that PNGRB needs to be complimented for the proactive approach it has taken to roll out this program and he is confident that for the 10th round also, the industry would respond with great enthusiasm. He said that this initiative by PNGRB would provide benefits to the people of Haryana, and the Government of Haryana would provide all the necessary support required to fructify this plan. Chandigarh 26th December:- The 3rd day, of the Dev Samaj Mahotsava going on in the premises of Dev Samaj College of Education, Sector 36, Chandigarh, started with the soulful Bhajan,'Param Lakshya Guru Puran Hove'. In keeping with the Dev Samaj philosophy of conducting activities beneficial for society, a blood donation camp was organized by the volunteers of Dev Samaj institutions with the help of GMCH, Sector 32, Chandigarh. The camp was hugely successful with 73 units of blood donated. Dr. Agnese Dhillon, Principal, Dev Samaj College of Education said that such activities were especially undertaken during the Mahotsava to develop altruistic attitude among students. More than 250 volunteers came forward for this noble cause. Free Medical and Dental camps were also organized and more than 150 persons benefitted from them. Apart from the blood donation camp, the day witnessed wide ranging activities like a sonorous performance by the band orchestra comprising more than 100 students of the Dev Samaj schools in Chandigarh, Ferozepur, Delhi, Gurgaon and Akbarpur. A drama highlighting social and moral values enacted by the students of Dev Samaj Modern School, Nehru Nagar and Dev Samaj Modern School, Sukhdev Vihar, New Delhi was also held. The drama, 'Lapata Hai' presented in the evening session sensitized the audience to the need for safeguarding innocence and integrity. The play moved the audience to tears by the characters' emotional rendering of the relationships of parents and children, employer and employee, etc. The play was directed by Manoj Madan, Principal, Dev Samaj Modern School, New Delhi. Chandigarh 26th December:- Annual Function of Chitkara International School (CIS) is well recognized for its magnificent enactment and grand endeavour. Every input and effort is put in by the School to attain the finest of performance and reach the sparkling zenith. With sprightly curtain calls, with huge pomp and show, CIS hosted a 6 day long, 8th Annual Function, "Facade- The Structural Extravaganza", which commenced on 16th December 2018 at the school premises amidst great fanfare and gusto. Each day of the function took a head-start, with the 'structural footing', which entertained the audience through rapturous performance. The programme further picked the pace with 'Casting the Building Block', analogous to ceremonial lighting of the lamp. In this ceremony, Dr Madhu Chitkara, Chairperson, Chitkara International School, placed the topmost building block to the CIS's school emblem as the theme was directed towards structural extravaganza. The event revolved around the beautiful interpretation of various eras and the architecture of the same. The school choir followed by Qawali won a huge round of applause from the audience. The students manifested Ancient Egyptian, Roman, Gothic, Renaissance, Mughal, Neo-classical and Modernist period through their spell-binding dance performance. The senior wing students presented an amalgamation of celebrated structures of India comprising Konark temple, Ajanta and Ellora Caves and Sanchi Stupa through a dazzling dance performance. Apart from this the fillers on a beautiful rendition of the piquant-inferno, "Yampuri" evoked lot of interest from the spectators. Furthermore, the Annual Report was read out by Ishiqa Sharma, Joint secretary of the school. In her report, Ishiqa highlighted the achievements of the school in all spheres of academics and co-curricular activities followed by the outlook on the International exposure provided to the students. She also listed the awards that the school had received for its infrastructure and other academic and co-curricular activities. Throughout the event, the well researched Power Point Presentation running at the side screens filled the audience with bits of information relevant to the acts of that particular period. The each day's function concluded with a vote of thanks and warm smiles on everyone's faces. Expressing her contentment and take on the significance of the Annual Function, Dr Niyati Chitkara, Principal, Chitkara International School, added that the annual event is a marvellous platform for every child as it provides the needed spotlight and confidence to the students. It's an effort to inoculate inspired learning through dance, drama, art and music and thus it acts as learning beyond the classroom. Through this event, the school wishes to showcase and boost the best within every child. The larger than life portrayal of characters, the vibe, the magic and the experience of our Annual Function speaks volumes about the hard work coupled with the teamwork of the faculty and the students. Chandigarh 26th December:- All Contractual Karamchari Sangh gave notice of Maharally with families of Contractual and Outsourcing Workers on 24 January 2019 to Chandigarh Administration,Prime Minister And Home Minister. All Contractual Karmachari Sangh ,U.T.,Chandigarh gave notice of Maharally with Families in lieu of their genuine demands on 24.1.2019 at Rally Ground. Earlier in November Karamchari sangh demonstrated through five Point agenda program like Press Conference,Black Day on Constitution day, Candle March Protest and Black Flag March Protest etc on World Human Rights days while raising the demands of 20,000 Contract Employees and Outsourcing Workers fighting for the cause of Equality, Social Security and Security of tenure in the absence of any Central policy since 20 years in Chandigarh. Karamchari Sangh announced this Maharally with Families as administration is not listening to their genuine demands despite of member of parliament assurance also. All Contractual Karamchari Sangh is raising the voice since long against the exploitation and discrimination of qualified youth and intelligentsia in contract and outsourcing system and is demanding security of these employees and to stop hire or fire policy. Karamachari Sangh gave notice to Prime Minister and Home Minister to look into this matter for necessary action. Chandigarh 26th December:- Known as one of the leading five-star properties of City Beautiful, Taj Chandigarh has over the last decade come to being synonymous with luxury. Right from its well-appointed rooms to the conference halls along with banquet options, dining selections, spa, gym and a roof top pool, the hotel offers it all. Apart from all this grandiosity, it is also a fact that Taj Chandigarh has earned the reputation of throwing the best New Year parties in the city. This year too, they come up with an array of parties that are sure to leave the guests delighted as 2018 comes to an end. Mumbai Takies is being hosted at the massive grand ball room of the hotel. The New Year party is a must go for those who love the city of dreams for Taj Chandigarh is definitely bringing it to City Beautiful. Right from creating an elaborate Mumbai ambience to actually laying out an extensive buffet that is partially inspired by the cuisine of the region, this night to going to cater to it all. With free flowing beverages and delectable snacks, the evening is destined for a gourmet extravaganza. DJ KD takes the night on a high with his music as international dance performances excite further. Priced at 14,000/- per couple, it is a New Year party that is sure to give you a grand entry into 2019. For those who enjoy fun and games, the hotel is hosting the New Year Pirate Party, which brings in some fun props and décor to match. Here too the beverages and snacking are unending and the global buffet is extensive, which will set the ship a-sail to meet 2019. A live band performs through the evening and the pirate guests dance away the night. At 10,000/- per couple, the evening is perfect in more ways than one. Looking for something soft and quiet on New Year's Eve. Taj Chandigarh's Sparkling Black Lotus New Year Night is the place for you. A sit down seven course dinner served at the table with the sparkling flowing freely and soft music and candlelight adding to magic of the evening, this is an ideal end to 2018. Guests can book at 8,000/- a couple since the tables are fairly limited at this exclusive dining.